Looking to set up a blog with Ghost? While it still has a few rough edges and missing features at the time of this writing, as it’s essentially in beta at this point (hence the “0.3” versioning), it definitely shows promise as a blogging platform. This tutorial aims to walk you through the process of installing one ore more instances of Ghost behind the NGINX server. NGINX is a fast and lightweight web server that, when configured in this manner, acts as a proxy, forwarding requests to the correct Ghost blog. The figure that’s the most important is the RAM. Just like with the computer you’re using to read this, active applications reside in the system’s memory, and the amount they use varies depending on what the app is doing. Ghost, in my informal tests, doesn’t seem to be too memory-intense. So a 512MB Droplet could probably host a few Ghost blogs at once, depending on their popularity and how the system is configured. There are plenty of options for a VPS, though. If you’re not too keen on DigitalOcean, Linode, Rackspace, Amazon EC2 and RamNode are popular. 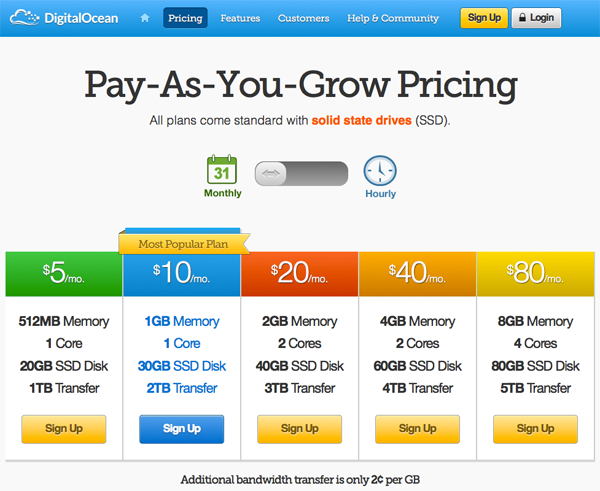 If you want to give DigitalOcean a try, you can sign up with the promo code DIVEIN5 to get a $5 credit. You can also pay by the hour if you just want to fire up a VM for a few hours to experiment before making a decision. Once you’ve got your VPS, it’s time to start setting things up. For simplicity, I will assume you are running Ubuntu 12.04. You can follow along with any Linux distribution on any hosting provider, but some commands may be a little different. First, if you haven’t already, use SSH to log in to your VM as root, using the password your host gave you. Take this opportunity to change your password to something different, and reasonably strong, for security. Just run the passwd command and follow the on-screen instructions. While you’re at it, install the unzip tool so you can unpack the Ghost archive later on. I hope you’re not a Media Temple customer, because I have bad news. GoDaddy has just acquired the hosting company, according to the press release they put out today. SCOTTSDALE, Ariz. (Oct. 15, 2013) — GoDaddy, the Web’s largest platform for small businesses, has acquired (mt) Media Temple, a Los Angeles-based Web hosting and cloud services company focused on the creative class of digital designers, developers, entrepreneurs and innovators. The two companies will continue to operate independently. The strategic acquisition provides GoDaddy with direct access to Media Temple’s hosting gurus, who will share knowledge and insight on how GoDaddy can better serve Web professionals and developers. GoDaddy provides scale and investment for (mt) to accelerate its growth and further expand internationally. Media Temple is a popular option for Linux-challenged web designers seeking managed hosting with a friendly control panel, though they pay significantly more for the convenience. Though that may change as GoDaddy’s influence permeates their acquisition. 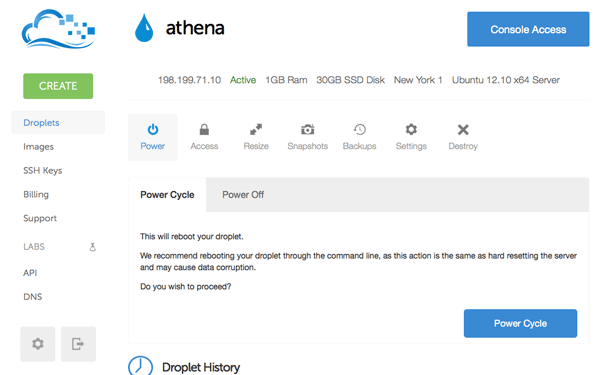 Since the beginning of April, this site has been hosted by DigitalOcean. I’ve been a longtime customer of VPS.net—from September of 2009 up until April of 2012—but the difference in service was so huge that I had to switch. While VPS.net was a good choice back in 2009, when I chose them over the then-comparable Linode, their competition has outpaced them over the years. I’m now getting substantially more for half the price. It was a big decision to move, but I’m glad I did. Their cheapest plan gets you a VM with 512MB of RAM and 20GB of space for a mere five dollars per month (or $0.007/hour). That’s cheaper than a lot of shared hosting plans, for a speedy box with full root access. The plan I’m using is their $10/month option, which comes with one gigabyte of memory. Backups and snapshots of VMs are priced reasonably, with backups costing 20% of the server’s price (e.g. $1 per month for a $5 per month server) and snapshots being $0.02 per gigabyte stored. DigitalOcean has a freshly redesigned control panel, from which you can manage your servers, DNS, billing and other settings. It’s also the place where you can set up your API access if you want to manage things from a mobile app, command line utility, or even use a Vagrant provider. I’ve been very happy with DigitalOcean since my big switch, and definitely recommend them if you’re in the market for a decent VPS provider. If you want to give them a try, here’s my affiliate link. If you enter the promo code SSDPOWER on the billing settings page, you’ll get $10 worth of free credit. You can spin up a VM, play around with it, and delete it when you’re done. Amazon recently launched their latest Web Services Product, which aims to help you store data for the long term. Amazon Glacier costs one cent per gigabyte per month to store data, with some limitations on the retrieval. It costs $0.12/GB to retrieve data if you need to access more than five percent of what you stored. It also will take a few hours to retrieve the data. Given the very low price and the long retrieval delays, it is a logical assumption that Amazon is using magnetic tapes for the storage. Amazon suggests that the service would be used for archiving and preserving records, media, scientific data, or anything that requires long-term storage. It would work well for off-site backups in general, even for your personal computer, since storage is absurdly cheap and you don’t need to retrieve backups too often. There are countless alternatives for the services GoDaddy offers, but many newbies are not too aware of them. After all, they don’t pour money into TV ads during the Superbowl. Since I’m frequently asked for suggestions, I figured it would make for a good post. It is usually prudent to register domain names with a separate company from the one that actually hosts your web site. That way, if you have cause to switch for one reason or other, you can simply edit the DNS to point it to your new host, and you don’t have to worry about transferring the name from one service to another. Want to test how your server performs under load? If you’re in the process of optimizing a server, or have just installed a caching solution, it’s good to see the effect your changes have had. 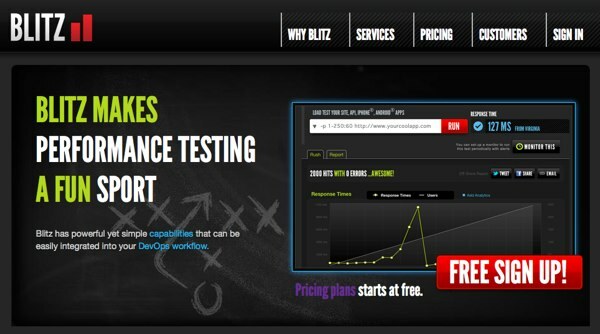 Blitz is a configurable service that will pound your site with page requests, allowing you to specify the concurrency, timeout, and duration of the onslaught. As it goes about this, it builds statistics and plots them along timelines. You can watch response times, errors and timeouts as it slowly ramps up the number of concurrent users until it reaches the maximum. At the end, it even projects how many hits per day your setup can handle at that rate. I found Blitz very useful when I was trying to squeeze faster response times out of my WordPress setup, tweaking my caching system options and adjusting Nginx and PHP configurations. Since they use the connections at their datacenter, you get more real-world results than if you simply ran Apache Bench locally on the server, or from your residential internet connection. Both tools have their uses, of course, and Blitz is a good one to have in your arsenal. Fortunately, the solution is simple. You just need to run sudo dpkg-reconfigure console-setup and follow the on-screen prompts. You would usually use the arrow keys to traverse the menus, but that isn’t exactly possible, is it? Pressing the first letter of the option you’re looking for until it cycles up and is selected works fine, though. (Apple Laptop, USA-style layout, etc.) The full instructions on what you should pick for MacBooks are available here. Now, moving in and out of the VM window is a little bit annoying, so I installed an SSH server. How Much Does Amazon CloudFront Cost for a Small Blog? Amazon CloudFront is one of the cheaper CDNs, but many people worry about it’s seemingly complicated pricing scheme. Since you pay for what you use, your monthly bill is calculated based on how many gigabytes of data you transfer and how many HTTP requests are made. You pay $0.0075 for every 10,000 HTTP requests, and $0.12 per gigabyte for North American and European visitors. The cost-per gigabyte is slightly higher for other regions, but it doesn’t go over $0.25/GB. So how much do you end up paying for a blog with around 40,000 page views per month? $0.64. I’ve been running CloudFront for a little while now, and I ended up paying about sixty-four cents from the 3.004GB of transfer incurred over the month of January. It’s definitely affordable, and should help take some load off your server, besides decreasing load times. GitHub is great for open source projects, but the lack of free private repositories can be limiting for projects that you would rather not be shared with the entire world. While it does make sense to pay for a tool if you use it extensively for commercial purposes, you may not be ready to if you’re an indie developer just beginning a project that won’t hit the shelves for awhile. Also, if you’re using it for versioning and deploying websites, you may not want to have all of your source be public. GitHub’s business model is primarily the sale of premium accounts with varying numbers of allowed private repositories, starting at $7/month for five private repositories and up to one collaborator. It’s not a bad deal at all, as GitHub is by and large open source projects, but you may still want to find a better offer. Fortunately, there are a couple of solid competitors. BitBucket is very much like GitHub, functionally. It has the same sort of social collaboration tools, and most of the same features. But that’s where the differences end. Their pricing scheme is to give you all of the repositories you could possibly want, both public and private, while charging to add extra collaborators to your private repositories. You get five for free, and can upgrade to ten for $10/month, twenty-five for $20/month, etc.. Oh, and they support both Git and Mercurial. I’ve been using BitBucket lately for some of my projects, and it’s been great so far. Beanstalk only does private repositories, offering plans limited by disk space and the number of repositories, as well as the number of authorized users. Aside from their 100MB single-repository trial plan, their offerings start at $15/month for 3GB of space, 10 repositories and 5 users. One of their unique selling points is their integration with tools like Basecamp and Lighthouse. They also have quite a few corporate customers. I have hosted Webmaster-Source, along with my other websites, on VPS.net since September of 2009. It has been an excellent experience overall, and has provided me with an opportunity to get my hands dirty and gain some hands-on experience configuring and maintaining a web server. Their cloud system has been solid, with the only unscheduled downtime (that wasn’t my fault!) being a brutal Denial of Service attack that occurred a couple months after I signed up. I love the scaling features and flexibility they offer, and their support has been excellent so far. Tickets are answered quickly, their on-demand “here’s some money, please fix this for me” service is a lifesaver, and they constantly monitor their Twitter account and forum. Two years later, I finally finished ironing the kinks out of my setup. I’m running the tiny and lightning-fast NGINX server, which servers PHP scripts through php-fpm. It uses very little RAM compared to the usual Apache setup that is the de facto standard. There’s still room for further optimization, but I’m very pleased with what I have so far. I have to wonder: why do so many people have an issue with them? They’ve provided nothing but stellar service to me, and other bloggers who have voiced their happiness with VPS.net. I’ve noticed a recurring theme among complainers being that cPanel isn’t installed by default, so I have to wonder: are most of the dissatisfied customers people coming from shared hosting, lacking Linux skills, and not wanting to learn how to set up and administer a server? I really wonder if they’re having a fundamental misunderstanding of the product, and they’re thinking they’re buying a managed VPS at the cheaper price of an unmanaged one. They do offer a managed service, which I have seen people write about, saying they were “shocked” that they would demand money to “set up their website.” I guess that’s why the have their new idiot-proof Cloud Hosting option now.